The Ivanpah Solar project being built in the northeastern Mojave Desert will destroy nearly 5.6 square miles of desert habitat when it is completed, an swath of previously pristine desert that is difficult to fathom. 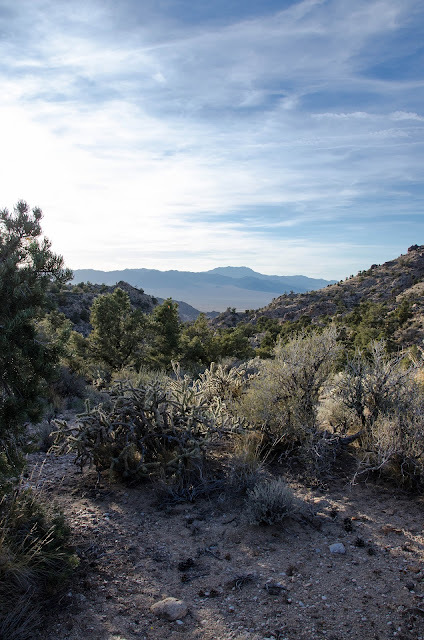 Thousands of creosote bushes, Mojave yucca, cholla cactus, and rare wildflowers. Cactus wrens, thrashers, and burrowing owls. Kit foxes, and jackrabbits. Rattlesnakes and desert iguanas. And a thriving population of desert tortoises. All of this is lost in our quest to generate 392 megawatts of solar energy -- electrons that could have been produced more efficiently and responsibly with rooftop solar. Clark Mountain is an impressive mass towering over the desert, and visible from many parts of the Mojave National Preserve. 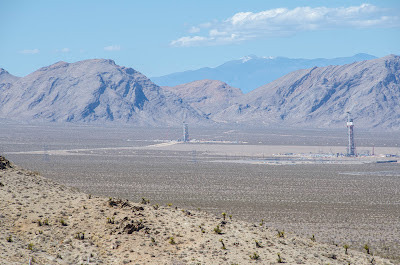 This photo was taken from the New York Mountains, with Clark Mountain in the distance, across the Ivanpah Valley. How much has changed since Michael Jackson's Earth Song video was released in the mid-1990s? The most sustainable change starts from the grassroots. Not from slogans, mass e-mails, glossy PR campaigns, or Wall Street. Of all nature's wonders that capture our attention, it's easy to take our soil for granted. But a new study reaffirms the importants of cryptobiotic soil crusts. As the study explains, "organisms fuse with soil particles, stabilizing desert crusts and forming fragile peaks in the soil that influence a variety of processes to allocate important resources." KCET published a great article on these crusts and explaining the important functions they play in desert ecosystems. These layers take many years to form, and are very fragile. As we disturb and destroy desert soils, we are turning back the clock on an ecological fabric that could take decades to repair itself. The Department of Interior today released the final version of a policy that will smooth the way for industrial-scale solar energy development on public lands throughout America's southwestern deserts. Even though Interior weakened environmental protections seen in earlier drafts, and crafted the policy to meet industry demands--essentially putting on paper what is already Interior's de facto policy of allowing solar companies to bulldoze wherever they please--several national environmental groups still applauded the announcement, including the Sierra Club, NRDC, the Wilderness Society, and the national Audubon Society. Their statements of support for the policy probably represent efforts to put positive spin on what is ultimately an environmental catastrophe for the renewable energy industry and our public lands. BLM sent a letter to the California Energy Commission (CEC) this month recommending stronger measures to mitigate or monitor BrightSource Energy's proposed Hidden Hills Solar project. If approved, the project would be built in the Pahrump Valley next to th California-Nevada border, and draw an estimated 227.1 million gallons of water during a 29-month construction period, and 45.6 million gallons each year during operation. Groundwater is already severely overdrawn in the Pahrump Valley, causing subsidence in the land that may ultimately reduce. the amount of water that can be stored. 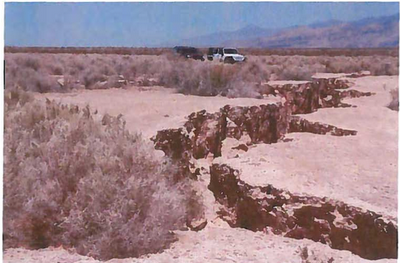 BLM provided the following photo of large cracks in the land near the proposed Hidden Hills solar site-- an indication of subsidence resulting from overdrawn groundwater. Many national environmmental groups think that the solution is to find alliances with multi-million dollar companies on Wall Street to advance a sustainable agenda. But when they do that, they have to make compromises on how they define "sustainable" and "green". The world can only be sustainable if the 99% acts sustainably. Solar panels on rooftops, not on desert wildlands. Flipping off the light switch for the room you are not using. Recycling your plastics. Taking a bike, and not a car. Sharing the planet with a growing population will not be easy, and saving the wildlands we love will be even more challenging. The US Fish and Wildlife Service (USFWS) is accepting public comments until midnight 12 July on a proposal to extend eagle "take" permits -- permission to kill or harass protected bald and golden eagles -- from 5 years to 30 years. The move is intended to make it easier for the wind energy industry, which is building massive wind facilities that are already killing the protected birds. For some good background, Chris Clarke wrote a great piece on the proposed rule on KCET. The bottom line, though, is that wildlife officials will end up giving permission to wind companies to kill eagles over a 30-year period, and eliminate flexibility to save the birds if their numbers dwindle during those 30 years. How will the USFWS save a threatened bald or golden eagle population if they cannot do anything to stop one of the birds' biggest threats -- spinning wind turbines -- because they issued too many permits some 30 years earlier? 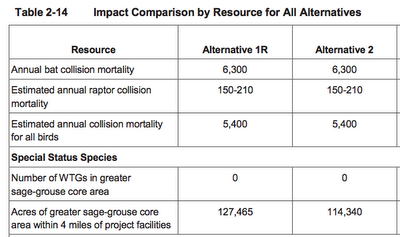 The Director of the Sierra Club's Beyond Coal Campaign and the group's Deputy Conservation Director applauded Department of Interior's plans to authorize a 355 square mile industrial wind facility in Wyoming that is expected to kill as many as 5,400 birds and 6,300 batseach year. The Club's "Blowing in the Right Direction" article in Grist claims the energy could be shipped nearly 700 miles to Nevada in order to replace the dirty Reid Gardner coal plant, even though the Sierra Club released a study in June saying that Reid Gardner could be shut down by implementing local energy efficiency measures that actually save ratepayers money. The Clean Coalition and Sierra Club of California filed a petition demanding that the California Public Utilities Commission (CPUC) reconsider and strengthen its planned implementation of a feed-in-tariff (FiT). Solar Done Right applauds this petition and encourages the CPUC to implement a more robust FiT. Local clean energy advocates believe that the CPUC’s late May decision on how to implement California SB 32—a law passed in 2009 requiring CPUC and utilities to expand FiT programs in the state—failed to address the law’s requirements and does not fairly compensate ratepayers for the value of distributed generation. Specifically, the petition notes that the FiT formula in the CPUC decision does not recognize one of the greatest benefits of rooftop solar installations to other utility ratepayers—the avoidance of new transmission and distribution costs, which are required when the utility companies invest in expensive and remote power plants far from the point of use. 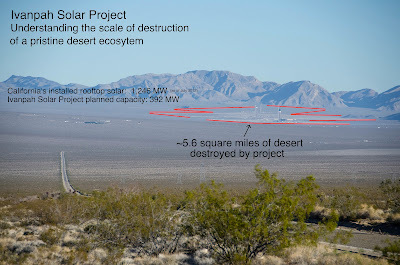 BrightSource Energy -- the company that has destroyed 5.6 square miles of pristine desert habitat in the Ivanpah Valley for a massive solar facility there -- recently assumed responsibility for Solar Trust of America's (STA) proposed Palen Solar power project during an auction of bankrupt Solar Trust of America's project pipeline. 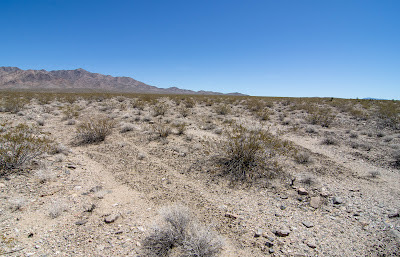 The project would be built on nearly 8 square miles of desert habitat between Blythe and Desert Center, California, and would impact Mojave fringe-toed lizard habitat. Do You Know Where Your Solar Energy Will Come From? Why is Pacific Gas & Electric (PG&E) buying solar power from hundreds of miles away when the sun shines on PG&E customers' rooftops just like it shines anywhere else? The utility company for much of northern and central California plans to buy solar power from BrightSource Energy's proposed Hidden Hills Solar facility, which would be built in a remote corner of California known as Charleston View. Getting that energy to our cities will require depleting natural resources far from PG&E customers, lots of money, and a financial gamble by a small electric utility in Nevada.